Drum Class (Ages 6-12) If you are ready to Rock and Roll, this is the class for you! Students bring their own drum pads and sticks to class, participate in group actiivies, and also receive individual help on the drum set. Great for learning rhythm notation, steadiness of tempo, fluid drumming technique, and coordination. Ongoing, $60.00/month plus yearly registration fee. Time: Tuesdays 5:00 - 5:45 pm. Guitar Class (Ages 6-10) For beginners through Level One, students will receive one-on-one instruction plus learn through group activities. Material included, students should bring their own guitars. Ongoing, $60.00/month plus yearly registration fee. Time: Saturdays 11:30 a.m. - 12:15 p.m. Piano and Music Readiness (Ages 3-5) Introduction to piano and music designed to be fun and educational for the very young. Children will learn rhythm, pitch recognition, and the basics of piano technique and music reading. In class, we will use rhythm instruments, keyboards, and our singing voices. It is helpful if your child has a keyboard to practice at home, though not required. Great preparation for our Level One music classes or private instrument lessons. Ongoing, $55.00/month plus yearly registration fee, materials included. Choice of Times: Tuesdays 5:00-5:30 p.m., Thursdays 5:00-5:30 p.m., or Saturdays 11:00-11:30 a.m. 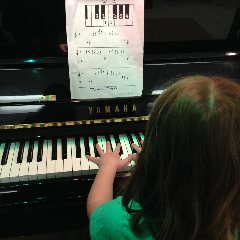 Piano Leve One (Ages 6-10) This class is for the novice up to the intermediate level. Students will learn technique, music theory, music reading, rhythm and pitch recognition. Concepts are taught by a combination of one-on-one instruction and group activities. New students can join anytime, please call ahead. Students have the opportunity to perform in recital and in National Guild of Piano Teacher Auditions at their option. Ongoing, $60.00/month plus yearly registration fee, materials included. Choice of Times: Mondays 6:00-6:45 p.m. or Wednesdays 6:00-6:45 p.m. Piano (or Guitar or Violin), Singing and Acting - Level One (Ages 5-8) We are excited to be able to provide a variety of activities in one unique class, allowing younger children to experiment musically at their chosen instrument, with their voices, and have fun acting as well. Children will learn basic music, music reading, technique, acting and singing skills, develop confidence, and have a great time. Ongoing, $60.00/month plus yearly registration, materials included. Choice of Times: Mondays 5:00 - 6:00 p.m., or Tuesdays 6:00-7:00 p.m., or Wednesdays 5:00-6:00 p.m., or Thursdays 5:30 - 6:30 p.m., or Fridays 5:00-6:00 pm, or Saturdays 10:00-11:00 a.m. or Saturdays 1:30-2:30 p.m. Piano (or Guitar or Violin), Singing and Acting - Level One (Ages 8-10) As above, but structured for the older Level One student. Ongoing: $60.00/month plus registration fee, materials included. Choice of Times: Mondays 5:00-6:00 p.m., or Tuesdays 6:00-7:00 p.m., Wednesdays 5:00-6:00 p.m., or Thursdays 5:30-6:30 p.m. or Saturdays 10:00-11:00 a.m. or 1:30-2:30 p.m.
A longer, more advanced class to further develop skills. Permission of instructor is required. Ongoing, $68.00/month plus yearly registration fee, materials included. Time: Mondays 6:00-7:30 p.m., or Wednesdays 5:00-6:30 p.m., or Thursdays 5:30 - 7:00 p.m. Also covers music theory, composition,music improvisation, and continuing development of technique. Violin Class for Ages 6-10 - Beginners through Level One. One-on-one instruction plus group learning activities. Students learn at their own pace. Technique, ear- training, music reading. Students should bring their own violins. $60.00/month plus yearly registration fee, materials included. Time: Mondays 5:30 p.m. - 6:15 p.m. Private lessons are scheduled once per week at a mutually convenient time for both you and the teacher. There is no registration fee for private lessons. Private lessons are payable at the beginning of each month for the number of lessons in each month. Each 30-minute lesson costs $32.00; a 45-minute lesson would be $48.00, and an hour lesson would be $64.00. Normally, a 30-minute lesson is suitable for a beginner. 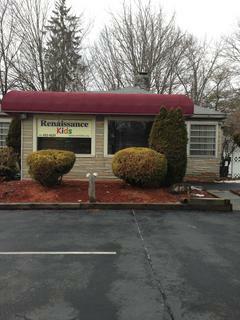 For specific questions or to set up private lessons, please call us at 845-452-4225. Do to the format of our group music classes, and our commitment to best serve each individual student, we do not offer "free" trials. If you would like your child to do a "trial" in one of our group music classes, there will be a charge of $10.00. This $10.00 amount will be credited towards your child's first month of class, should he or she decide to continue, provided that the first month of class is within 30 days of the trial class. We do not bill for partial months. If your child is starting part-way through a month, the first month of tuition plus the registration fee is payable upon enrollment. Thereafter, payment is due at the first class of each month. You are welcome to make up any missed classes on another day, please phone ahead.